Kermanshah / Kirmaşan Province is one of the 31 provinces of Iran . The province was known from 1969 to 1986 as Kermanshahan and from 1986 to 1995 as Bakhtaran . In 2014 it was placed in Region 4 , with the region's central secretariat located at the province's capital city , Kermanshah . Kemanshah consists of 14 shahrestans : Dalaho County ; Gilan-e-gharb County ; Harsin County ; Islamabad-e-gharb County ; Javanrud County ; Kangavar County ; Kermanshah County ; Paveh County ; Qasr-e-Shirin County ; Ravansar county ; Sahneh County ; Sarpol-e-Zahab County ; Solas-e-Babajani County ; Sonqor County . Major cities and towns in Kermanshah Province : Kermanshah ; Eslamabad-e Gharb ; Paveh ; Harsin ; Kangavar ; Sonqor ; Javanrud ; Salas-e-babajani ; Ravansar ; Dalahoo ; Gilan-Gharb ; Sahneh ; Qasr-e Shirin ; Sarpol-e-Zahab . The province's capital is Kermanshah (34°18′N 47°4′E) , located in the middle of the western part of Iran . The population of the city is 822,921 . The city is built on the slopes of Mt.Sefid Kooh and extended toward south during last two decades . The builtup areas run alongside Sarab River and Valley . City's elevation average about 1350 meters above sea level . The distance between Kermanshah and Teheran is 525 km . It is the trade center of rich agricultural region that produces grain , rice , vegetable , fruits , and oilseeds , and there are many industrial centers , oil and sugar refineries , and cement , textile and flour factories , etc . The airport (Shahid Ashrafi Esfahani Airport) is located in north east of the city , and the distance from Tehran is 413 km by air . The province has a rich Paleolithic heritage . Many caves with Paleolithic remains have been surveyed or excavated there . some of these cave sites are located in Bisetun and north of Kermanshah . The first known physical remains of Neanderthal man in Iran was discovered in Bisitun Cave . Do-Ashkaft , Kobeh , Warwasi , and Mar Tarik are some of the Middle Paleolithic sites in the region . Kermanshah also has many Neolithic sites , of which the most famous are Ganj Dareh , Sarab , and Asiab . At Ganj Dareh , the earliest evidence for goat domestication have been documented . In May 2009 , based on a research conducted by the University of Hamedan and UCL , the head of Archeology Research Center of Iran's Cultural Heritage and Tourism Organization announced that the oldest prehistoric village in the Middle East dating back to 9800 B.C. , was discovered in Sahneh , located in west of Kermanshah . The monuments found in Kermanshah show two glorious periods , the Achaemenid and Sassanid eras . The mythical ruler of the Pishdadian is described as founding the city while Tahmores Divband built it . An alternative narrative is that the construction was by Bahram IV of the Sassanid dynasty during the 4th century CE . Kermanshah reached a peak during the reign of Hormizd IV and Khosrau I of Sassanids , before being demoted to a secondary royal residence . The city suffered major damage during the Arab invasions but recovered in the Safavid period to make great progress . Concurrent with the Afghan attack and the fall of Isfahan , Kermanshah was almost completely destroyed by the Ottoman invasion . During the Iran–Iraq War the province suffered heavy fighting . Most towns and cities were badly damaged and some like Sar-e Pol-e Zahab and Qhasr-e-Shirin were almost completely destroyed . As it is situated between two cold and warm regions enjoys a moderate climate . Kermanshah has a moderate and mountainous climate . It rains most in winter and is moderately warm in summer . The annual rainfall is 500 mm . The average temperature in the hottest months is above 22 °C . Kermanshah lends its name to a type of Persian carpet named after the region . It also has famous sweets made of rice , locally known as Nân berendji . The other famous Kermanshahi good is a special kind of oil , locally known as Rüne Dân and globally in Iran known as Roghan Kermanshahi . The Giveh of Kermanshah known as Klash is the highest quality Giveh . Bisotun : Darius the Great's inscription at Bisotun , which dates to 522 BCE , lies some 1300 meters high in the mountains , and counts as one of the most famous sites in Near Eastern archeology . The site is a UNESCO World Heritage Site , and has been attracting visitors for centuries . The Behistun inscription is to Old Persian cuneiform what the Rosetta Stone is to Egyptian hieroglyphs , the trilingual inscription (in Old Persian , Elamite and Akkadian) was crucial in the decipherment of the script . The relief above the inscription depicts Darius facing nine rebels who objected to his crowning . At the king's feet lies Gaumata . The location of this important historical document is not coincidental : Gaumata , a usurper who is depicted as lying at Darius' feet , was a Medean and in Achaemenid times Behistun lay on the Medea-Parsa highway . Behistun is also notable for three reliefs at the foot of the hill that date from the Parthian era . Among them is a Hellenistic-era depiction of the divinity Bahram as the Greek hero Hercules , who reclines with a goblet in his hand , a club at his feet and a lion-skin beneath him . Because it lies on the route of an ancient highway , this life-size rock sculpture may reflect Bahram's status as patron divinity of travelers . Taq-e Bostan : The rock reliefs at Taq-e Bostan lie 6 kilometres (4 mi) northeast of Kermanshah , where a spring gushes from a mountain cliff and empties into a large reflecting pool . One of the more impressive reliefs , inside the largest grotto (ivan) , is the oversized depiction of Sassanid king Khosrau II (591–628 CE) , who appears mounted on his favorite charger , Shabdiz . Both the horse and the rider are arrayed in full battle armor . There are two hunting scenes on complementary sides of the ivan : one depicts an imperial boar hunt and the other depicting the king stalking deer . Elephants flush out the boar from a marshy lake for the king who stands poised with bow and arrow in hand while he is serenaded by female musicians following in other boats . These royal hunting scenes are narrative murals in stone are count among the most vivid of all Iranian rock reliefs . The Taq-e Bostan reliefs are not limited to the Sassanid era . An upper relief depicts the 19th century Qajar king Fath-Ali shah holding court . The Kangavar archaeological complex : Kangavar is the site of the archaeological remains of a vast Hellenic-style edifice on a raised platform . The visible remains at the site date to early Sassanid times , but the platform of the complex may be several centuries older . By the time excavation began in 1968 , the complex had been preemptorily associated with a comment by Isidore of Charax who referred to a temple of Anahita at Concobar (the Greek name of Kangavar , which was then in Lower Medea) . Despite archaeological findings to the contrary , the association with the divinity of fertility , healing , and wisdom has made the site a popular tourist attraction . The vast edifice was built of enormous blocks of dressed stone with an imposing entrance of opposed staircases that may have been inspired by the Apadana in Persepolis . 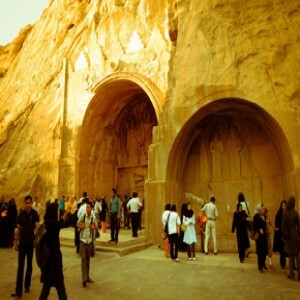 of the renowned scientists and writers of this region is Al-Dinawari who was born at Dinawar north-east of Kermanshah . He lived in the 9th century and has written many books in astronomy , botany and history . Notable people born in Kermansha include British author , Nobel prize winner , Doris Lessing , whose father , a British army officer , was stationed there at the time of her birth . Mirza Ahmad Khan Motazed-Dowleh Vaziri created the first printing office and founded the first private school of Kermanshahan . Guity Novin a painter and a graphic designer who has founded the Transpressionism movement was born in Kermanshah .